Since I’m working full-time I started planning my meals, especially the diners! In the weekend I make a list what-to-eat until wednesday and based on that I make a shopping list, on wednesday I make a list for the rest of the week.This is neccesairy because my husband is working 5 days a week as well and in the evenings he is a Handball trainer and coach in the Dutch Handball Premiere League, which means he is training his team for 4 evenings a week and has to leave quite early every evening. So there’s not so much time to make dinner, let alone for shopping crocery’s! 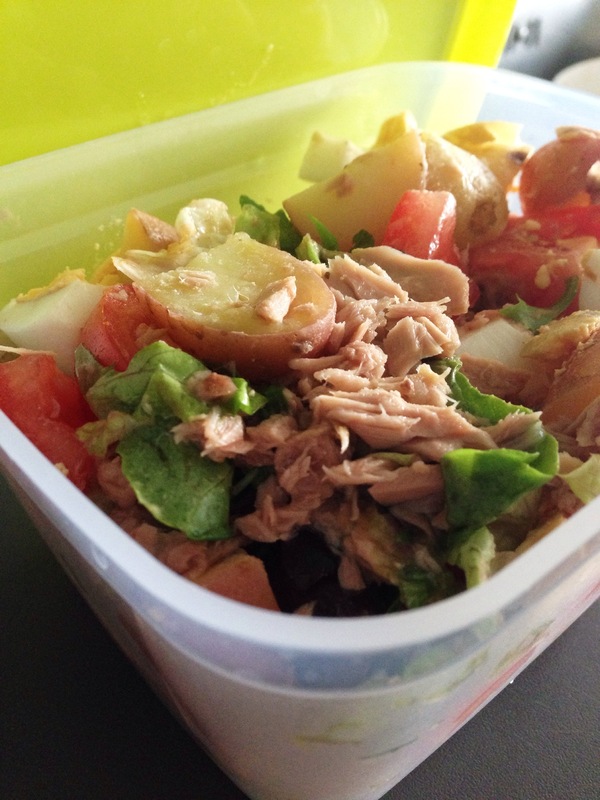 Today I’m sharing the salade niçoise recipe with you! It’s a very easy dish, quick to prepare and full with healthy and tasty vegetables. You can give it your own swoosh as well, I’ll even share some ideas for that with you 😉 Read along for the recipe! I made a portion for about 3 persons so I can take the leftovers to work with me for lunch tomorrow. Boil the eggs for about 8 minutes, drain the water and let the eggs cool down under a cold running tap. Peel and slice into quaters. Cut the artichoke hearts in smaller pieces, the bell peppers in strips and the tomatoes in wedges. Boil (use only a little water) or steam the potatoes until they’re done and cut into wedges. Put the eggs, artichoke, bell pepper, tomatoes, potatoes and olives in a bowl. Drain the canned tuna above another bowl because we need the oil to make the dressing. 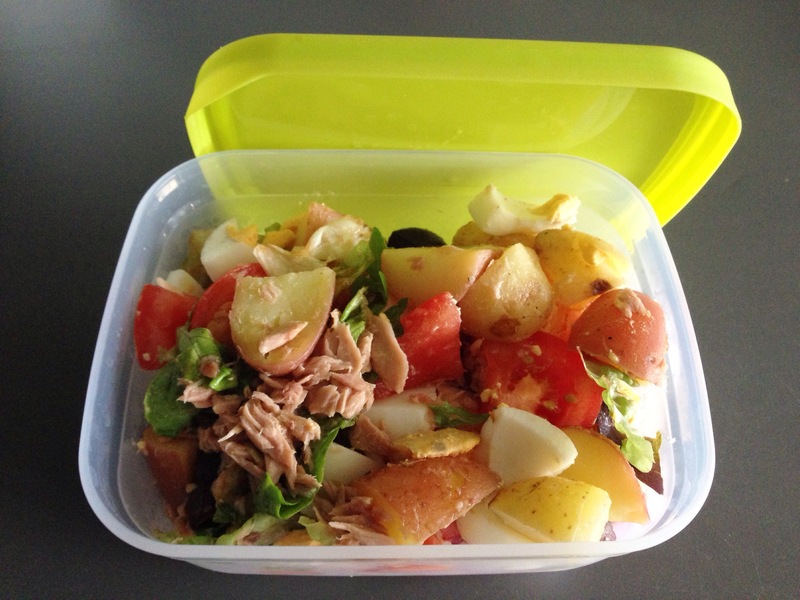 Put the tuna in the bowl with the potatoes and the vegetables. For the dressing we mix the tuna-oil with the lemon juice, add a little salt and pepper to taste. Cut the basil leaves in small strips and add to the dressing. Serve. * Use the kind of bell peppers you prefer! * Add some extra tuna or an extra egg if you have a very busy and active lifestyle, the protein supports the recovery of your muscles! Posted in Diner, Lunch, recipes, SaladTagged diner, dinner, fit, food, glutenfree, glutenvrij, healthy, healthy lifestyle, lunch, natural, recipe, salad, soyfree, sugarfree, suikervrij, vegetable, vegetables, veggie, veggiesBookmark the permalink.